In Aleda E. Lutz (1915 – 1944) she graduated from Saginaw General Hospital School of Nursing and started working at the Saginaw General Hospital. U.S. entry to World War II had a significant impact on the Lutz family – despite their German heritage, there was no questioning their loyalties. Aleda’s brother and two of her nephews enlisted in February 1942. 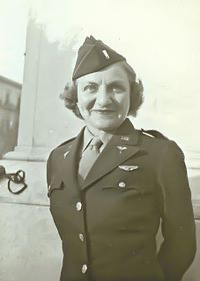 Aleda Lutz was commissioned as a Second Lieutenant in the Army Nurse Corps. During this time she wrote to her parents about the increasing deployments of nurses, and soon she too would have her chance. In December 1943, Lutz received a promotion and deployment orders to North Africa with the newly organized 802nd Medical Air Evacuation Transportation Squadron. Lutz’s responsibilities included transporting supplies to the frontlines and wounded soldiers to the rear. She was a member of six separate battle campaigns in her nearly two-year deployment and over 3500 service members she evacuated, survived as a result of her care. Many of her flights – in aircraft not protected by the Red Cross symbol – were to areas still actively entrenched in combat. Lutz regularly volunteered for flights, once completing four in one day. She held the record for the most evacuation flights (196), and most combat hours flown by a flight nurse (814). In November 1944, Lutz participated in her last Medical Evacuation. The plane she was on crashed, killing the flight crew, German prisoners of war, and wounded American soldiers on board. Lutz’s military decorations made her the 2nd most decorated female service member in the U.S. military.